Roti prata is a fried flour-based pancake that is cooked over a flat grill. It is usually served with a vegetable or meat based curry and is sold all over Singapore in food centres. Prata is also commonly cooked (upon request) with cheese, onion, banana, red bean, chocolate, mushroom or egg. Roti Prata is prepared by flipping the dough into a large thin layer before folding the outside edges inwards. The dough will then be heated on a hot plate. Flavorings or toppings, if ordered, can be added either before or after it is flipped, depending on the flavorings or the desired outcome. The 'tissue' and 'paper' variants are pan-fried with butter, rolled into a cone shape and sprinkled with sugar. Roti prata is a traditional South Indian food. It has always been known as Parota in India while it is usually known as roti prata in countries like Singapore. Roti prata and the Malaysian variant Roti canai are served slightly differently, influenced by each country's culture. There are also differences in nomenclature in Singapore and Malaysia. 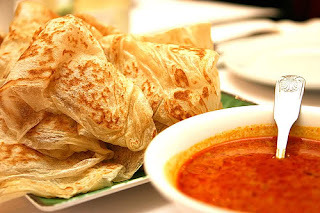 In Singapore, the varieties of roti prata are named mostly in English, such as cheese prata or onion prata, whereas in Malaysia they are commonly named in the Malay Language, such as roti telur for "egg prata." Although the term roti canai is used for the Malaysian variant, the term roti prata is used in Southern Malaysia.